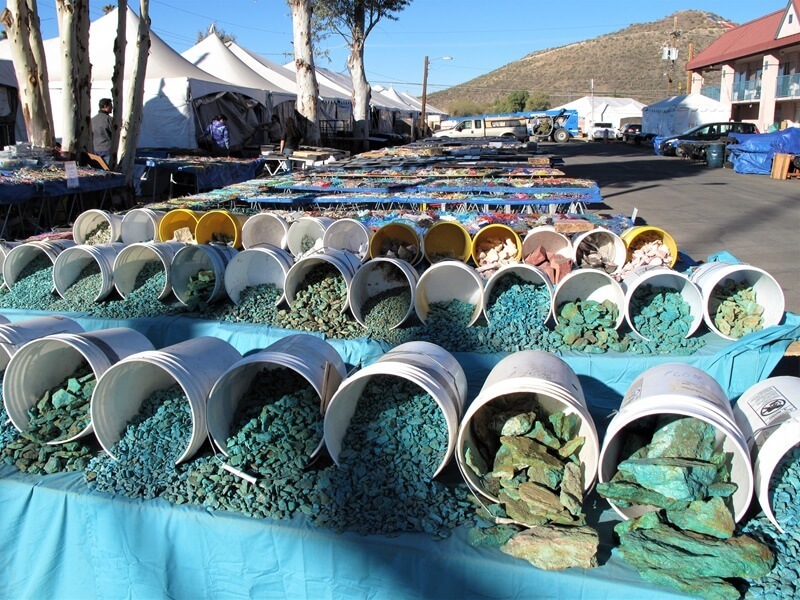 've been attending the Tucson gem and mineral shows for as long as I can remember. My family moved to Tucson in 1980, and the Show was one of the things we just did. Though in early years our visits were a little limited in duration, as three small children among so many “sparklies” is enough to drive even my amazing mom a little bit insane. Almost every year since, no matter where I lived around the state, I would return to Tucson for the Show for my yearly dosage of rocks. After moving back to Tucson as an adult, I learned there is a rhythm to the city around gem show time, which feeds into anticipation, almost a giddiness, that starts building well before the Show begins the last weekend in January. Though, amusingly, that anticipation usually starts about a week after the gem show ends each year, when a friend calls to give me the countdown to how many days until the start of the following year's show. Only 286 days until the gem show! … Only 145 days until the gem show! In the spring and summer there are frequent thoughts and reminders that sneak into daily living. Where will I be showing this year? … That’s great stock to have for the Show, set it aside. … You need to order business cards early this year. Throughout the year I participate in other gem shows around the country, and the Tucson topic seems to always arise. Do you show in Tucson? … Where will you be set up this year? … Do you know of a good venue? … You're familiar with Tucson, where can I find polished Utah septarian? As the year swings into fall, messages, calls and emails with friends become more frequent. Will you be in Tucson this year? Great, so I'll see you at the Inn Suites the second weekend. Friends from out-of-state begin planning their visits and where they will stay. My sisters, both involved in the Show — one is president of Aerolite Meteorites, the other is a silversmith and owner of Sirocco Designs, now located in Chile, who comes back every year to set up at the Show — and I really begin focusing on preparations, and conversations are more frequently Show related. I just got an incredible meteorite slice and am getting it prepped for the show, it's going to be amazing. … I'm working on finishing the last of the rings before heading into Santiago for the trip. In December, the city starts to change, and you can feel the giddiness and excitement amp up a notch. For me, it begins with the monstrous tents going up. Every year my mom calls and belts out The Tents Are Going Up song she's been singing for as long as I can remember (to the tune of The Farmer in the Dell). Depending on how long I can hold out before laughing, she may even make up new verses. As December progresses, white tent tops are visible over the walls along freeways, and billboards advertising the gem show venues start appearing around town. Little reminders and teasers of the joy that is to come. My days are focused more on the Show — plans for what I'm bringing this year, who will be arriving when, where will I be meeting people, did I order business cards? (no, I haven’t, and my printing guy is always doing an order last-minute), putting displays together, making labels and packing stock, creating shopping lists and determining who I’m going to visit first. In January, the big trucks, sitting low to the ground, and semis hauling shipping containers loaded with material, become more common on the roads. Next, motor homes with out-of-state plates and the dented pickups struggling to pull weighed-down trailers — the vehicles driven by the vendors — start to arrive. The city takes on a busy, bustling feeling —more activity, heavier traffic around the freeway, a little longer wait in line at the restaurants. This is the beginning of the “pre-Show," when I begin spending more time in the gem show corridors at the hotels and tent venues, along with all the other vendors, preparing what will soon be our business location and home for the next three weeks. Crates, yet to be unpacked, are being moved by incredibly talented forklift operators. The anticipation to see what is inside is almost overwhelming. Only the knowledge that in just a few days I will see whatever glorious specimen has yet to be revealed keeps me moving on, rather than waiting for the top of the crate to be pried open. People are arranging tables, rolling display cabinets precariously balanced on creepers down sidewalks, and setting up small tents among the existing giant ones. Boxes and packing materials are strewn and piled haphazardly as display items are unwrapped. The purposeful movements of the old-timers contrasts with the overwhelmed and lost appearances of those helping or showing for the first time. Inevitably the opening of the Show will be upon us and it will be almost three weeks of madness, even with all the previous planning. Continually moving, meeting friends not seen in a year, working my booths and room at the shows where I sell, trying to get to as many show venues as possible, and, best of all, viewing all the rocks. The show is a feast for the senses. The colors — white tents, bright eye-catching banners hanging from hotel balconies, polychromatic advertising fliers on most every spare space not filled with rocks, and black dented 55-gallon drums and blue plastic bins filled with treasures. The movement — signs blowing in the wind, people scurrying every direction, and forklifts and vehicles maneuvering around piles of rocks and distracted visitors. The sounds — warning beeps of trucks backing up, heavy pallets being placed on the ground, and hundreds of different conversations occurring in, seemingly, as many different languages. Even the smells are gem-show specific — dirt and wet newspaper comes foremost to mind, mixed in with the aroma of cooking food. The familiarity, a sense of being home, is ever-present — old standby venues, hotels I haven't been in for a year, yet know every corridor. Entering a room specifically looking for the vendor and knowing I will be met with a huge hug and "How are you? Tell me about your past year! ", randomly running into gem-show friends while walking around the different venues, and evenings filled with parties, meetings, dinners, and sitting outside the room at the Inn Suites sharing the day's finds. And, of course, the rocks. Everywhere. A feast for the eyes, mind and soul. Every color, type, form. Fossils, mineral specimens, meteorites, jewelry, findings, rough, carved, faceted, cabbed, slabbed. They’re on tables, hanging on walls, in bins, flats and barrels; in piles of rough poured out on the ground; in tubs half submerged in water, two-toned with dull colors transforming to rich hues visible below the water line. Others sparkling behind locked cases, or in the enormous tents, or in smaller 10 x 10s set up at a single table along the I-10 frontage road. They’re in fenced overstock areas and shipping containers; in hotel courtyards, lobbies, hallways and under stairwells; in every room, on every surface, under tables and beds. In every nook and cranny — everywhere you turn — Rocks. Simply wondrous and glorious and fantastically overwhelming. By week three of the Show there are feelings of both regret and relief that it is winding down. Did it really go that fast? … I didn't get to the Pueblo yet, crap! … I'm so looking forward to a day off and quiet and not moving and just being still. Disappointment arises because some friends won’t be seen for another year. Sorrow that an event with no comparison worldwide, that has been the focus of your own world for months, is coming to an end. The pace slows. Goodbyes are said. Newspapers, boxes and broken pallets fill hotel dumpsters. The sounds diminish. The big trucks, with a little more clearance now, are fewer and fewer on the roads. The tents start coming down. Eventually, the city returns to normal. Once the Show is over, there is a strong need for a few days off to catch your breath and finally have a full night’s sleep. After which, there is a surfacing to reality and returning to the daily mundane life you’ve gladly suspended. One that does not involve being entirely submerged in the Tucson gem shows. It’s time for paying overdue bills, replying to emails that have waited unanswered for weeks, touching base with friends not involved in the rock and gem world who still understand why you have been completely off the radar for over a month, and grocery shopping because you’re down to a carton of spoiled milk and a wrinkled apple in the fridge. But … under the supposed “normalcy” you feel like something is slightly off, a vague sense something is missing, almost a mourning of things lost. And then there is the call. Only 340 days until the gem show. Suzanne Morrison is the owner of Raining Rocks, a Tucson-based retail company featuring rocks, fossils, minerals, and meteorites. She holds degrees in Geology and Environmental Science and has the good fortune to work within her chosen field, a life-long passion. Suzanne has been attending the Tucson Showcase for over 35 years — the past ten as a vendor. Additionally, in her role as photographer, Suzanne has been a contributor to the Tucson EZ-Guide since its inception, and her photos can be found on past covers and interior pages. You can find her during this year’s show at her booth in The New Show (Grant Road and I-10), and throughout the rest of the year on Facebook (suzanne.morrison.9822), where she hosts educational live feeds, her website (itsrainingrocks.com) and Instagram (Raining_Rocks).